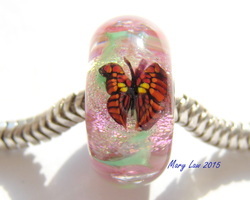 OOAK Pandora Style glass bead has two different Ryan Turner limited butterfly alternating with pink flowers with Cubic Zironia centers over green and gold vines on a base of pink/purple glass with sparkling flakes of magenta dichroic. 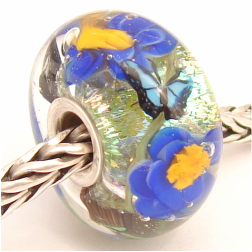 This glass bead measures 16 mm by 8 mm and it will fit on Pandora, Trollbead, Biagi, and Chamilia bracelets and necklaces and all other european charm bead systems. A solid sterling silver tubing core has been custom cut, filed, and pressed all by hand in my own studio. More pictures are just below. as they are even more beautiful in person! Email me at mclsra87@gmail.com with any questions. Payments are processed through paypal by the link below. A stunning bead with vivid red and pink flowers with bubble centers alternating with tiny white flowers over green and goldstone vines and a sparkling blue dichroic base of intense blue and pink. 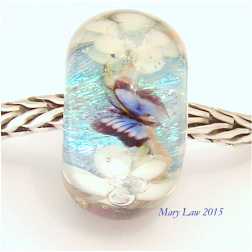 This is a OOAK handmade Lampwork Bead! pressed all by hand in my own studio. More pictures are just below. I love making these beads and sharing them with you and this is an exceptional bead! paypal by the link below. $48.00 plus shipping- Bracelets are not included. This a larger size focal bead that measures 17 mm by 10 mm and it will fit on Pandora, Trollbead, Biagi, and Chamilia bracelets and necklaces and all other european charm bead systems.A solid sterling silver tubing core has been custom cut, filed, and pressed all by hand in my own studio. More pictures are just below. Email me at mclsra87@gmail.com with any questions. Payments are processed through paypal by the link below. A stunning bead started with a base of light green glass with sparkling rainbow dichroic. Blue flowers with yellow/orange stamens alternate with a blue, green and yellow butterfly over green and gold vines. 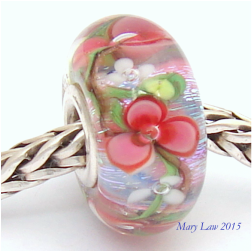 This is a OOAK handmade Lampwork Bead! Measures 16 mm by 8 mm and it will fit on Pandora, Trollbead, Biagi, and Chamilia bracelets and necklaces and all other european charm bead systems. A solid sterling silver tubing core has been custom cut, filed, and pressed all by hand in my own studio. More pictures are just below. $48.00 plus shipping - Please note Bracelet is not included. Thank you!